A very handsome sous-vide machine appeared at dinner last week with the Accidental Locavore’s friends Zhu Zhu and BJ. 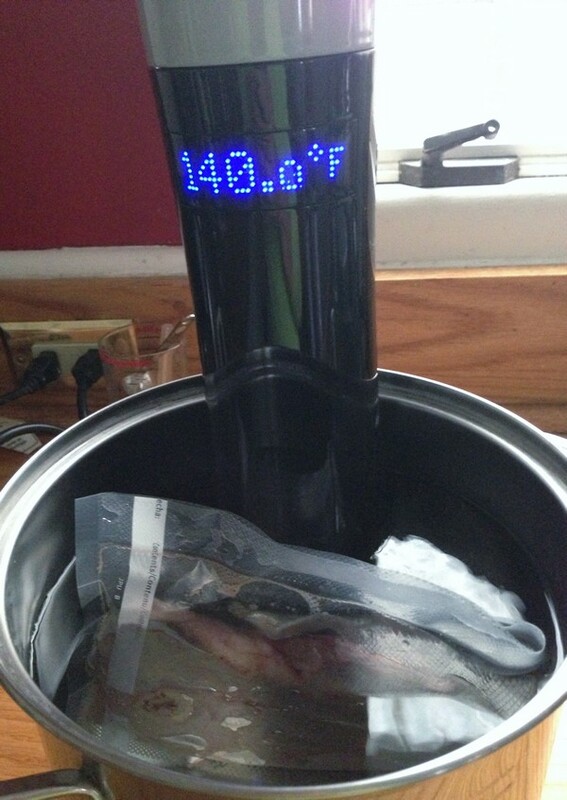 If you’re not familiar with cooking sous-vide, you vacuum seal the food and cook it in a warm water bath. It keeps food from over-cooking and keeps it tender and moist. You can hack sous-vide, using a slow cooker, but my new machine, a Sansaire, is a much better looking piece of equipment. Since I was on my own for most of the week, there was plenty of time to fool around in the kitchen without anyone but the dog, wondering what I was up to. 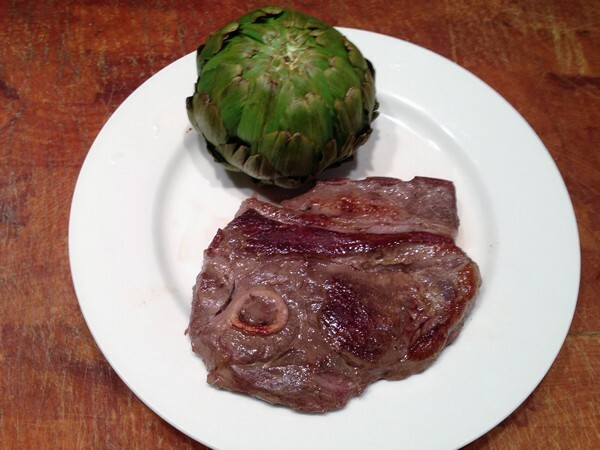 My first experiment with the Sansaire was a lamb shoulder chop. I rubbed it with a cut clove of garlic (my go-to first step) and then smeared some mustard with black truffle all over it, sprinkled with salt and sealed it up. Two hours at 140° and it was done. I know that seems like a long time, but it’s totally hands-off, so it’s just a matter of starting the cooking at a time that seems like an early-bird special. When the lamb was done, I unsealed it and tasted. Tender and juicy, it had a strong taste of truffle and garlic. I wasn’t in love with its general appearance, so after tasting it, it got tossed in a hot cast iron skillet to quickly brown and sear. What was surprising was how strong the taste of both the truffle and garlic came through, but not the mustard. 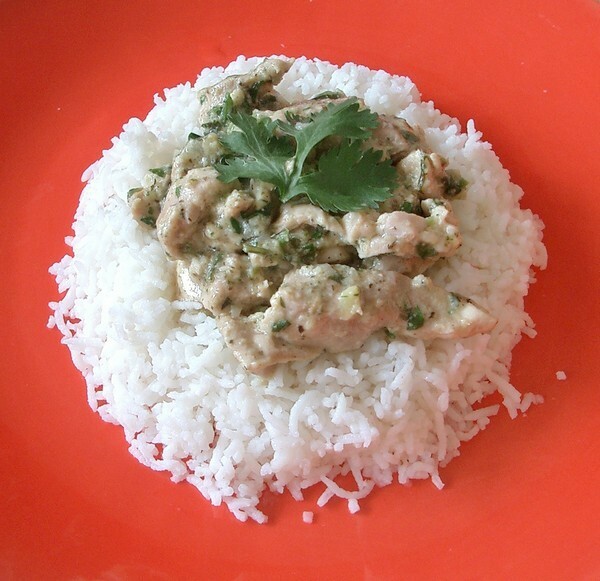 My second experiment was with one of my favorite recipes, Indian Chicken. Instead of cooking the chicken with the yogurt etc., I mixed all the ingredients in a bowl, tossed them in a vacuum bag, added the chicken, mixed it all well and sealed it. Another two hours, this time at 145° and I had my dinner. There was a huge difference between this and the usual way I make it. The chicken was so tender, almost velvety, and the sauce was thick and creamy (I’ve also discovered Cabot’s Greek yogurt, which is great for cooking). Definitely worth the extra cooking time! Even reheated in the microwave, the chicken retained its tenderness and the sauce stayed together, which is sometimes an issue when you’re cooking with yogurt). Next up? 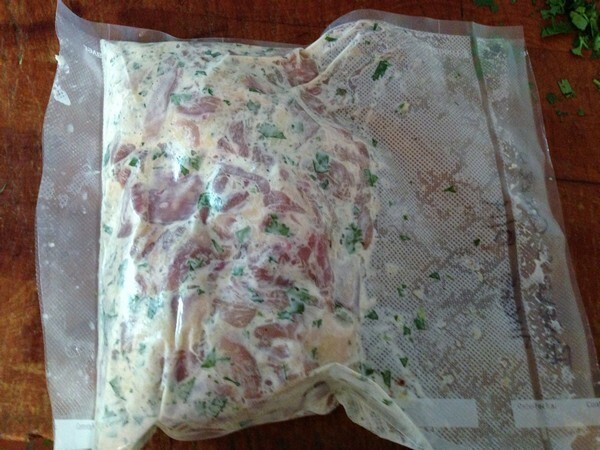 Sous-vide cooking some chicken in my favorite marinade and then tossing it on a hot grill to crisp up the skin – hello Memorial Day Weekend! Later in the summer, my favorite stuffed squash to see if the yogurt sauce it’s cooked in will also hold together. Stay tuned!